The Maldives will need massive amounts of aid to recover from last December's tsunami, which left damages in the Indian Ocean nation amounting to 62 percent of its gross domestic product, the World Bank said. The country would need some 304 million dollars "to effectively implement a recovery and reconstruction strategy," according to a preliminary tsunami assessment released by the the World Bank along with the Asian Development Bank and United Nations Development Programme. The assessment estimates total damages in the Maldives to be about 470 million dollars, which is close to 62 percent of GDP. "Most of the losses were concentrated in housing and tourism, with education, fishing, and transport also heavily affected," the Bank said on Monday. "About 120 million dollars of external financing will be required in the short term over the next six months." "The impact of the tsunami on Maldives was a disaster that affected the entire nation," said Alastair McKechnie, Maldives country director for the Bank. "Although the loss of life in the Maldives was mercifully less compared to other countries affected by the tsunami, the damage to the economy makes it one of the worst-affected countries. 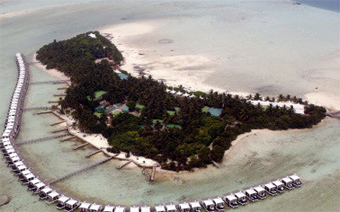 Twenty islands -- nearly one tenth of the 198 inhabited islands in the Maldives -- were largely devastated, and 14 islands evacuated. Almost one third of the country's 300,000 people were directly affected by the tsunami, with nearly 12,000 people displaced and another 8,500 temporarily relocated within their own islands." McKechnie said tourism would remain the major driver of the economy and the recovery of this sector would be critical for Maldives to return to economic growth.